TechsPlace | Do you enable push notifications on your smartphone? What exactly are push notifications? These are a form of alert or message that an application sends to a device. When the app is initially installed, a message pops up asking to enable push notifications. If you have any social media such as Facebook, Instagram, Twitter, or Snapchat downloaded and set up on your smartphone, it’s likely that you receive push notifications from them. On iOS and Android, the alert shows up in the form of a bar at the top of the screen. But what exactly is the purpose of a push notification? Well, it is specifically designed to entice the user to re-engage with the app. Your notification from Facebook may literally say, “Your friend commented on your photo,” but the subtext yells, “Hey, look at me! I still have valuable content to offer you!” And this isn’t necessarily a bad thing. Push notifications give us real-time updates and let us know what’s going on. They can also be interactive by offering a button that links to a website. These alerts can be used for social media, promotions, or any other content the app thinks we’ll be interested in. 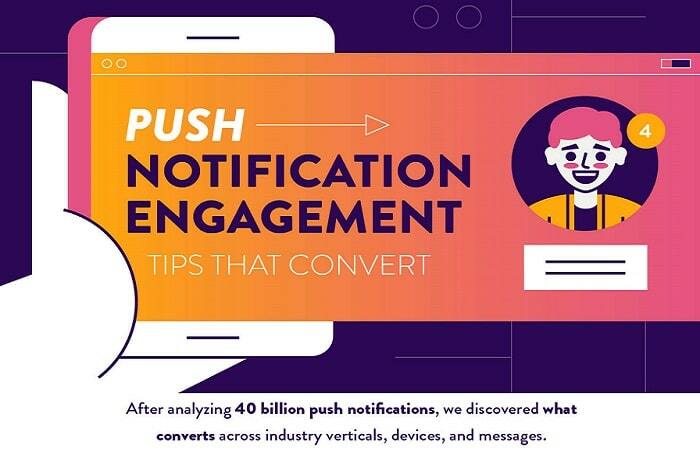 Feel free to skip to the infographic below to learn about some ways to increase push notification engagement. The common thought used to be that once your app was downloaded, your job was done. However, within two days of download, nearly three-quarters of users abandon the app. Push notifications play a significant role in app retention. By reminding and engaging users, these alerts boost app retention rates. Now the focus is on getting people to actually opt-in to receiving push notifications. Certain negative experiences such as aggressive advertising or loquacious family members on social media deter smartphone users from enabling push notifications. Marketers overcome this stigma by optimizing for the opt-in. There is more than meets the eye when it comes to this type of notification; it won’t work with just any text. Marketers have to implement a specific push notification strategy, including concise copy and best engagement times. The success of a push notification is measured by its CTR or click-through rate. The higher the rate, the better your notification performed. There are different factors that can positively affect the CTR. Personalization, rich media support, and interactivity are some ways to beef up your push notification. Check out the infographic from CleverTap to see how push notifications can increase the CTR, thus driving conversion and retention rates. To add to the surprising complexity of push notifications, optimal lengths and open rates vary depending on what industry the notification is for. There can be push notifications for business, entertainment, deals, education, health, travel, utilities, media, food, and retail. Similar to other ad campaigns, no push notification campaign should be the same across categories. They may share “power words” like discount or hurry, but the timing, length, and personalization will be different. Determining the frequency of when to send push notifications is like walking a tightrope; it’s extremely easy to get off balance. Mobile marketers have to find a happy medium between too many alerts and too few. Either end of the spectrum will end in the loss of a user. With all of the clutter, consumers are bombarded with today, it’s crucial to stay top-of-mind. If you send multiple notifications per day, you may be top-of-mind in a negative way. If you send hardly any, you will fall off the radar. A/B testing can be used to determine which message or CTA (call to action) on your push notification yields the best engagement or CTR. Multivariate testing can be used, however, changing only one variable at a time will likely result in a more accurate and clear conclusion. When A/B testing your push notification, two different versions of the alert will be sent randomly to your audience. The push notifications are sent at the same time and possibly with the same imagery, but they will contain different messages. The data from each are analyzed to determine which notification performed better. When done right, push notifications can be an effective component of your ad strategy. They are a solid complement to digital marketing. Your digital promotions will intrigue consumers, driving app downloads. Subsequently, a proper push notification campaign retains these consumers by maintaining their engagement with your brand.